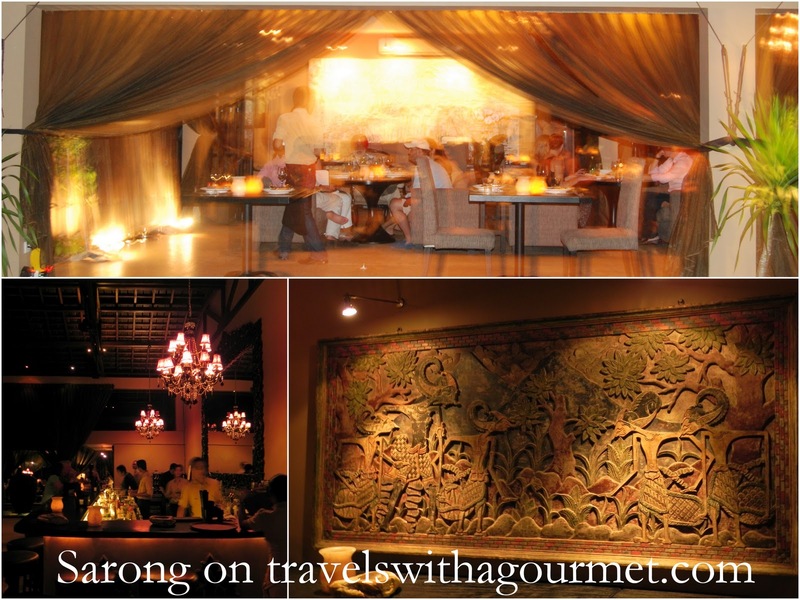 Sarong has quickly become our new favorite restaurant in Bali for the atmosphere with its’ cozy interiors (sofas doubling as banquettes and oval tables making the meal more convivial) and delicious family style Asian cuisine. 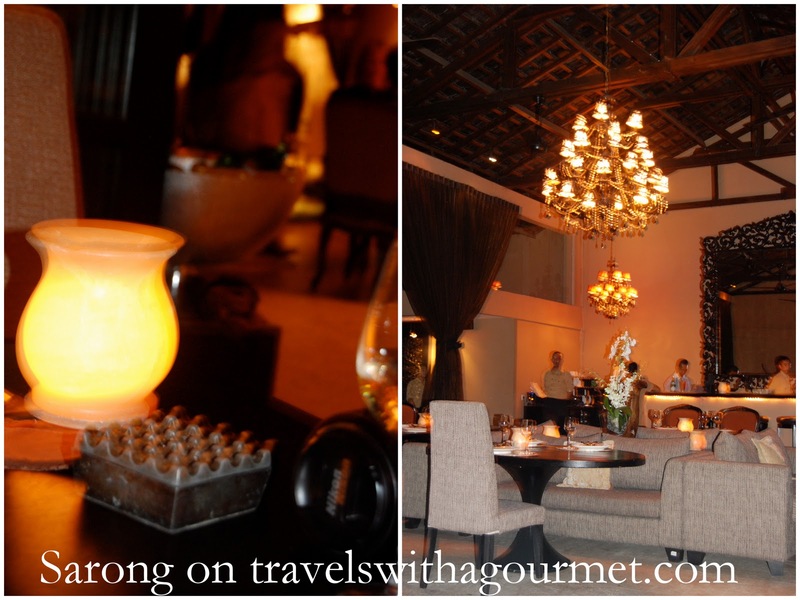 Our first visit to Sarong was just after we had moved to Bali, sometime in April. I had heard so many good reports about this hip restaurant that I was really looking forward to our meal there. A and I went on a weekday evening and shared two appetizers and two main courses. It was fine but the food was nothing special and the piped-in music of classic rock and pop didn’t help make the place trendy. Fast forward several months later to when A went back to Sarong for a work dinner and was pleasantly surprised with both the food and service, so much so that we went back for dinner soon after and have been several times more. On each visit, the place was packed, the music was hip, the service was seamless and most of all, the food was fantastic. When my family were here for a visit, I booked a large table at Sarong for their last night in Bali, knowing that everyone would have a great meal and a fun time. We arrived at around seven o a Friday evening to an almost full restaurant and were led to a large table set up in the front room. As soon as we sat down, drink orders were taken and wines were served along with their addicting tempeh chips and spicy cilantro dip. I had pre-ordered a family style set menu of two appetizers, a salad, three main courses, vegetables, rice and assorted desserts so we wouldn’t have to wait long for our dinner and clog up the kitchen with individual a la carte orders. 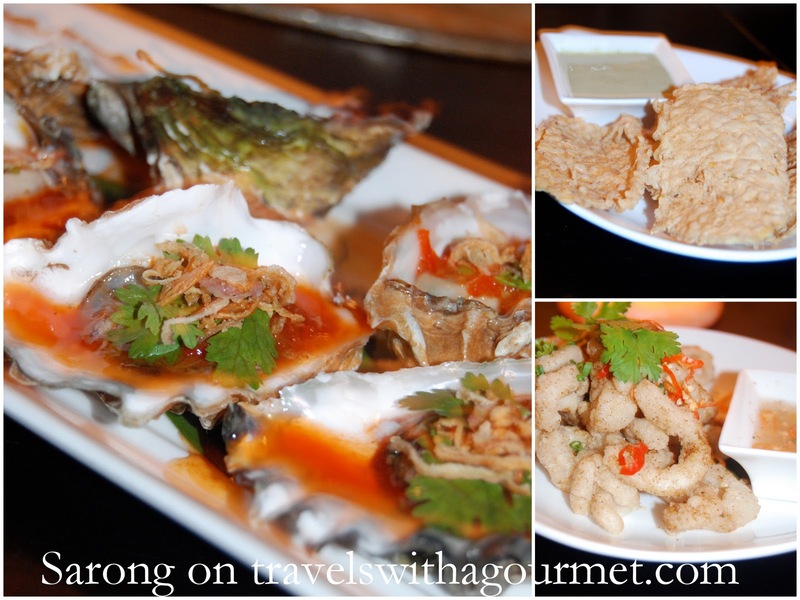 A few minutes later we were served our two starters – pacific oysters with coriander, deep-fried shallots and chili-lime dressing and the spicy salt and pepper squid. Both were delicious – the oysters plump and sweet and complemented by the crispy shallots and sour-spicy dressing, the squid were crunchy bits sprinkled with slivers of red hot chili. The cold Chilean Santa Ema Sauvignon blanc blended well with our first bites. Next came the salad of crispy salmon with watermelon, mint and basil – a fish version of the traditional Thai beef salad which was hot, cold, sour, salty, sweet and crunchy at the same time. I wasn’t sure that the combination would work but somehow the rich salmon, the cold sweet watermelon and the crispy salmon skin worked so well together making this dish the favorite of almost everyone at the table that evening. 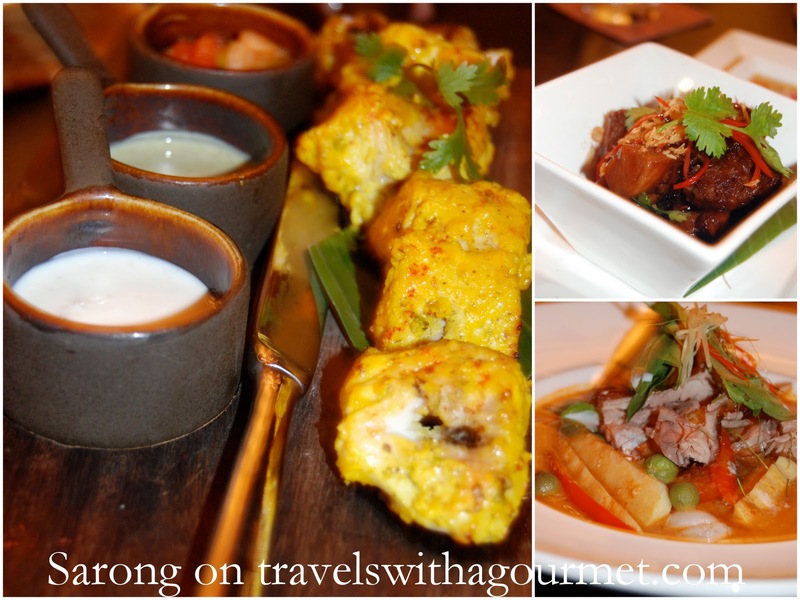 Main courses came soon after and I had chosen different dishes from their varied menu so we could have a taste of Sarong’s south-east Asian cuisine. From the tandoori, we had the Indian-inspired Ajwaini fish tikka cooked in saffron, cardamom, turmeric and lime. From the curries, we chose a red curry of duck with lychee, ginger and tomatoes and finally from the crispy things, we had the fried pork hock with tamarind and nam pla (Thai fish sauce). These came with Chinese broccoli with oyster sauce and garlic from the stir-fries section. Steamed jasmine rice and roti pratha (flaky bread) accompanied all the dishes. We were stuffed at this point but still had the assorted traditional Asian desserts to contend with – chendol (rice flour jelly noodles in coconut milk), mango sorbet and some sweet rice cakes. After some much-needed espressos, we left Sarong, sated and happy. *Open daily for dinner only. Book at least a week in advance especially on the weekend.